And Justice For Art: New "And Justice For Art" and "Extreme Shots" Exhibit at Florida Metal Fest 2016. New "And Justice For Art" and "Extreme Shots" Exhibit at Florida Metal Fest 2016. 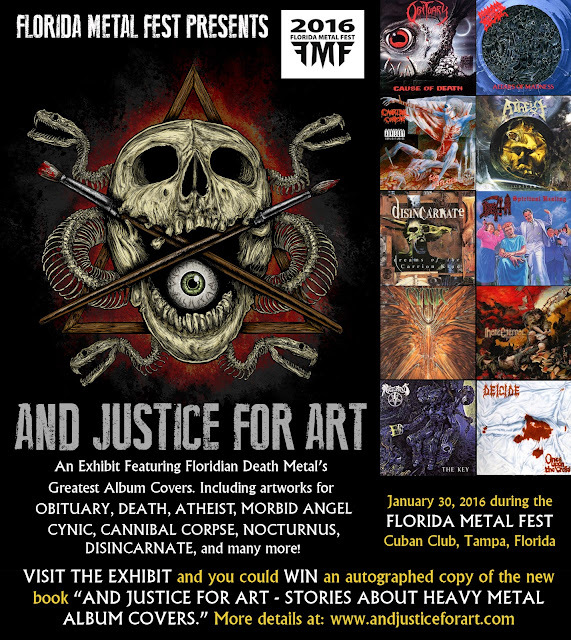 We're proud to announce the exhibit "And Justice For Art Presents: A Look To Some Of Floridian Death Metal's Greatest Album Covers." 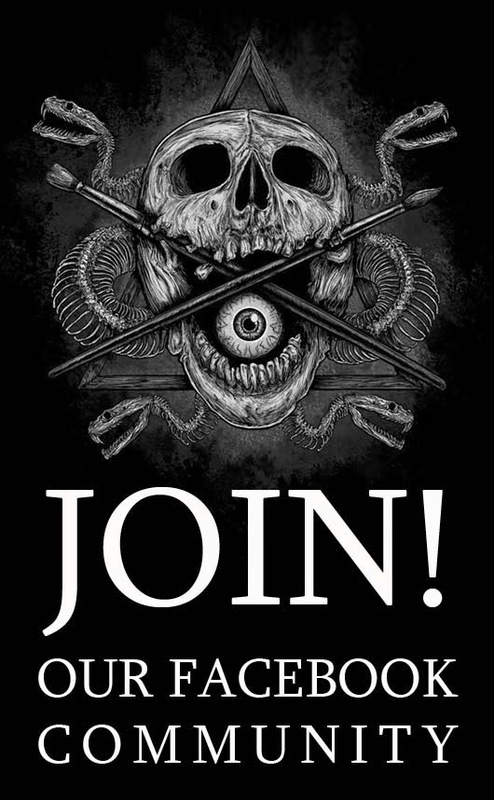 As the title indicates, this is a short but significant visual journey showcasing in glorious vivid colors, some of the most iconic artworks in the discography of bands like Morbid Angel, Obituary, Hate Eternal, Deicide, Death (Official), Nocturnus, Atheist, Cynic and many more... Next to each artwork there will be exclusive comments by musicians like David Vincent (ex-Morbid Angel) John Tardy (Obituary), Mike Browning (Nocturnus), Erik Rutan (Hate Eternal) and celebrated artists like Eliran Kantor, Dan Seagrave, among others. 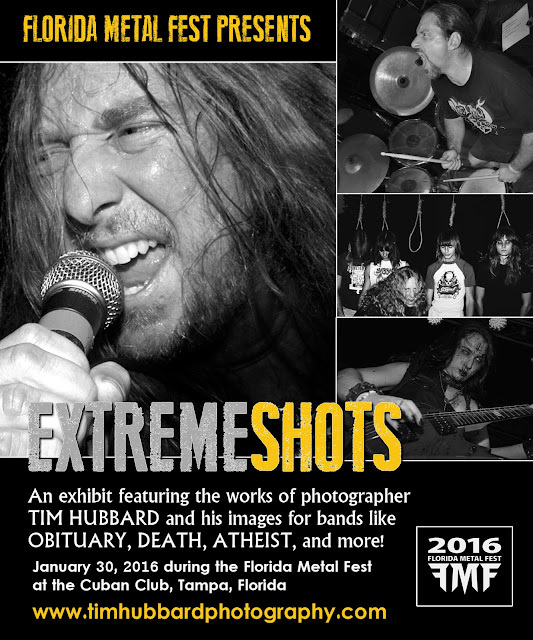 The exhibit will take place during the upcoming Florida Metal Fest on January 30, 2016. The "And Justice For Art" book will be also on display. Those visiting the exhibit will enjoy the possibility of winning an autographed copy of the "And Justice For Art" book and talking with the book's author, Ramon Oscuro Martos. In addition, renowned music photographer, Tim Hubbard, will be exhibiting some of his iconic images for bands like Obituary, Death, Atheist, Nocturnus, and many more. Martos and Hubbard will be also promoting "Extreme Shots", an upcoming book spanning more than 20 years in the Hubbard's career and his involvement with the Floridian Metal scene. You can now follow Extreme Shots on Facebook. Florida Metal Fest will take place on January 30, 2016. If you're coming, make sure to check out these unique exhibits. Florida metal fest looks like a real scary artwork to me ,plus on the other hand the work looks fantastic . the colours and the designs are really appreciable with the power of attracting a wide audience for your event!